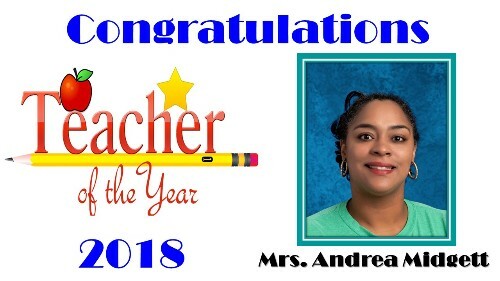 We are pleased to announce that the TA Howard Teacher of the year for 2018 is Mrs. Andrea Midgett. Mrs. Midgett has been a teacher for 18 years, in which 16 have been at T. A. Howard Middle School. She received her Bachelor of Science degree in Interdisciplinary Studies from Stephen F. Austin State University and her Masters in Education from Lamar University. Mrs. Midgett is a proud wife and mother of 5. She is currently the AVID Coordinator and AVID Elective teacher at TA Howard. Mrs. Midgett believes that teaching students to set goals is crucial to helping them be successful in life. One of her favorite sayings is, "Don't look back; You are not going that way!" Congratulations Mrs. Midgett - You Rock! GO KNIGHTS!